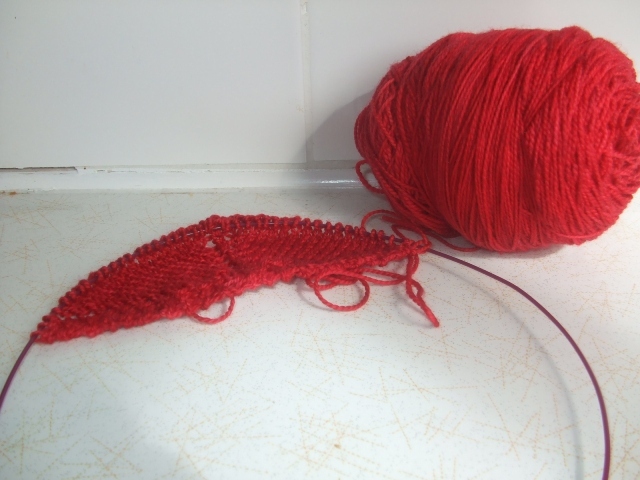 A few weeks ago I was stumped by the first installment of my Needlefood sock club yarn. I tried knitting it into a sock. The pooling drove me batty. I frogged it. And then looked at the yarn, waiting for it to tell me what it wanted to be. And so that’s what it became. A Simple Thing. I did one major modification in knitting this – the pattern calls for increases only on the right row (4 in total). I increased these 4, and also increased 2 stitches on the wrong side row, making a longer scarf to allow for wrapping more. 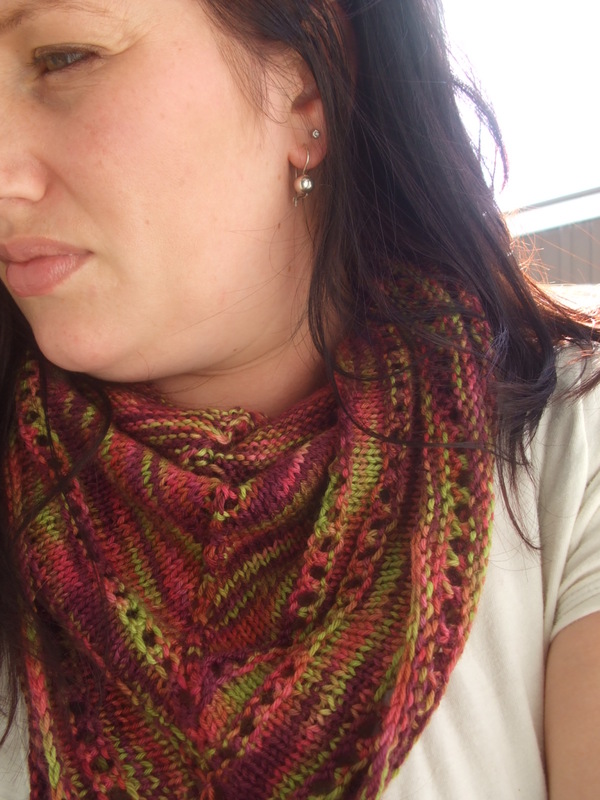 This also made it shallower, and so I knit an extra set of the pattern repeat. I have signed up for umpteen swaps many of which are due about now, so this is going to be rehomed in the near future 🙂 But I am glad that the yarn became something pretty before it left to find a new home. There! You can’t say that I didn’t warn you. But, oh, I am so glad that today has dawned slightly overcast and shows some promise of rain. 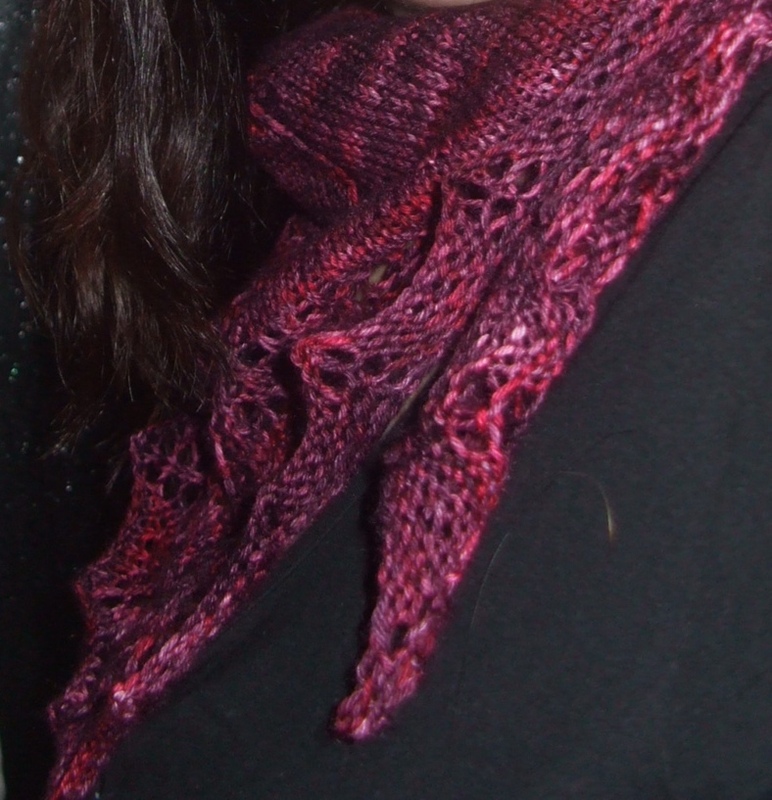 Because it is a perfect day to wear my new shawl. I think I’m going to wear it like this. Right – so, some vital statistics. Ooookay. Um, where to start? The pattern is well written and easy to follow. 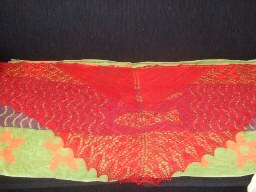 It offers the lace pattern both in chart and uncharts. 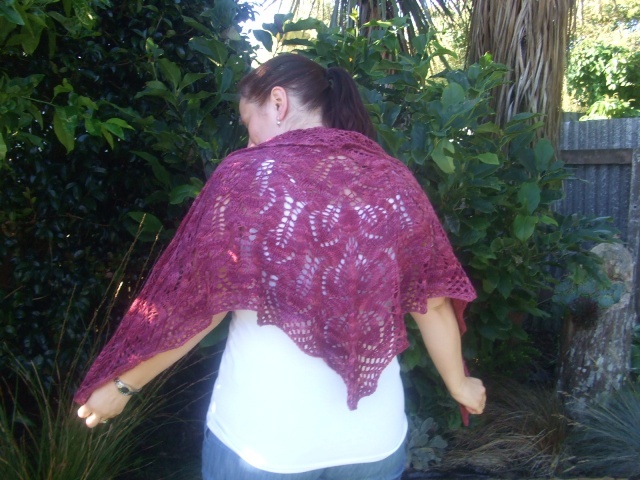 I chose to follow the uncharts because I had such a pleasant experience with them on my last shawl. Great! Easy to tell exactly where you are up to, what is repeated and where – plus with the charts there too, you can see a visual representation of the pattern if and when you want to. See, I told you that this was a rave review!! 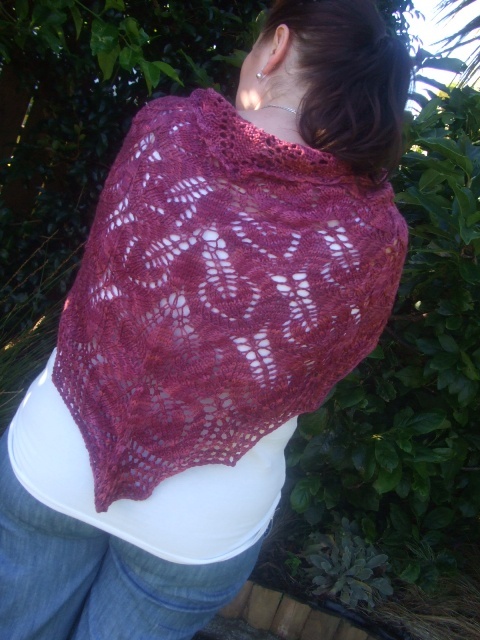 The pattern comes with three sizes, and this generously sized beauty is the small! It used almost all of my yarn. The pattern calls for 2 repeats of chart A, 3 of unchart B (one of the chart) and then one edging chart. 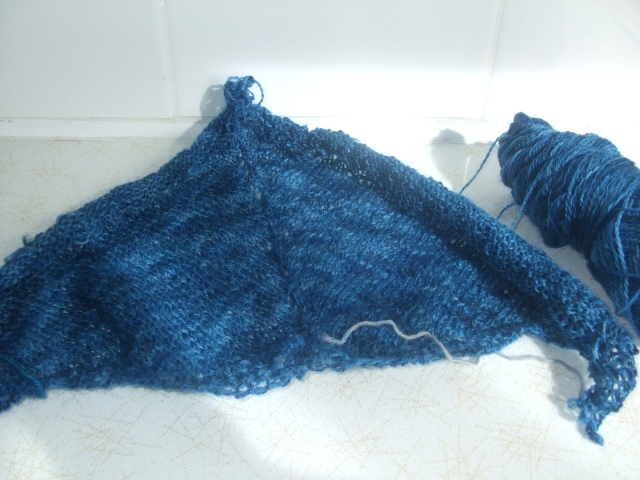 I wasn’t sure how my yarn useage would go, so I only knit chart A once. Then I knit chart B the required three times, and weighed my yarn. Heaps left! At four repeats I still had 50g left, so I knit a fifth repeat, making this the same number of rows as if I had done chart A twice. Then I went on to the edging chart and was confident I had enough yarn. This proved to be the case, but I am glad I had my scales for peace of mind – once I knew I was using 2g for a row, I knew there was plenty to last. 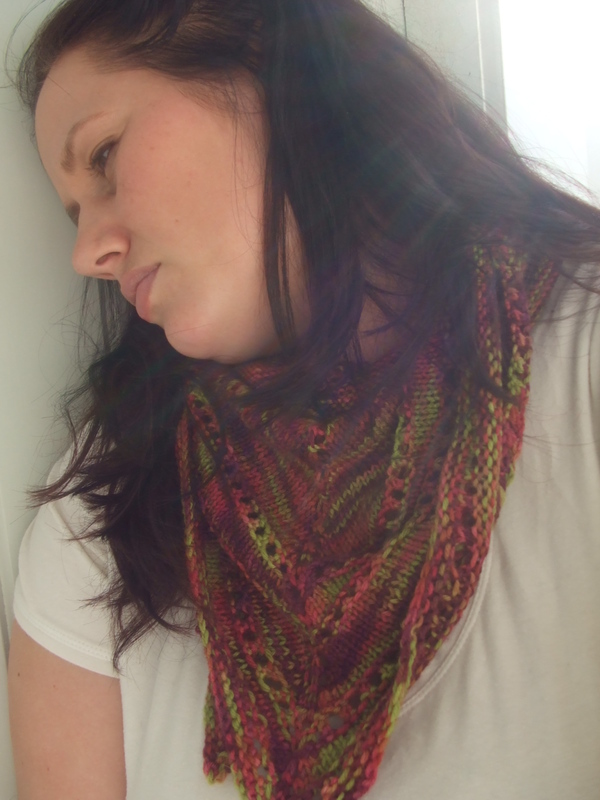 The yarn is so incredibly lovely to work with, I just want more! This was my total splurge though, so I might have to wait and perhaps line my sister’s suitcase with Tosh Sock if she comes for a visit. If waiting is indeed possible. The retail at WEBS is $26.70US which is discountable (20%) in a larger purchase ($60 or more or 25% if you spend over $120). Plus postage to NZ. But totally worth every penny. 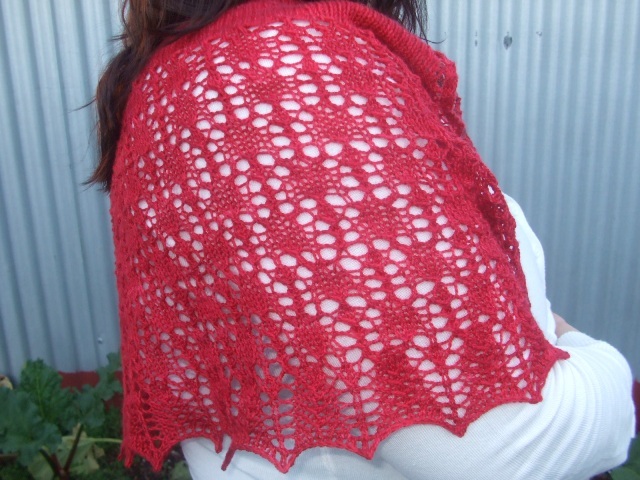 When I handed the shawl around at knitting night last night, one lady (a spinner too) was in awe of how incredibly soft it was, and thought it must contain silk. It is soft and really drapey. I’m just not sure I cuuld ever use this yarn on socks, it is so nice as a shawl. The colourway is nearly solid with enough variation to be interesting but it doesn’t detract from the lace pattern at all. So yes, this yarn should really come with a warning: dangerously addictive. Sorry if you were avoiding it, I’m not being very helpful, am I? 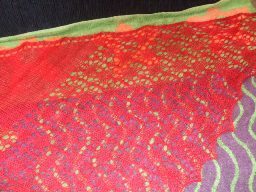 Yep, that’s my Branigan shawl all finished and blocking on an ugly beach towel. Minus the cat, who eyed it up and tried to jump on within 2 minutes of me finishing pinning it in place. But on the positive side, this is like the fastest blog post e-v-e-r thanks to only having to upload postage-stamp size piccies. I hope we get some sunshine tomorrow so it dries while I’m at work 🙂 Watch this space for bigger FO pics. The results of my recent yarn buying spree have been coming in to my mailbox over the last few days. So I thought that I would share the pictures of these yummies with you. First up is the first thing I ordered – some goodies from an 100 Pure Wool co-op. I ordered a couple of skeins of their 3ply worsted yarn, just to see what it is like and how it knits up. They are earmarked to add to the stash so I can avoid the yarn-buying crises that arises when I need to knit a gift fast. Following my yarn-buying philosophy from last year, I want to buy things that I will be happy to find in my stash, and to be able to use it for a variety of small projects. These filled the brief nicely, and were super cheap to boot. Go the co-ops! I also ordered two skeins of 4ply yarn, which I got superwash treated too – it’s another $2US a skein, but I thought it prudent in case these end up as socks. 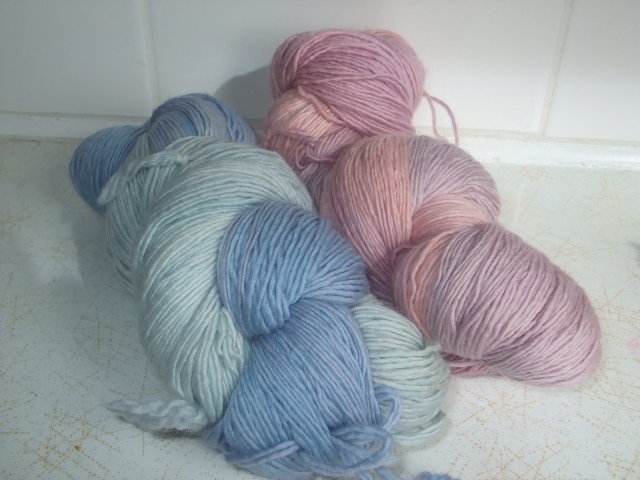 The colourways are Mares (the blue) and Melancholia (the pink). I wanted something different to what I already had stashed, and these are every bit as lovely as I was hoping. The other box of yarny goodness was from WEBS. I went on a MadelineTosh buying spree, and this is the result. 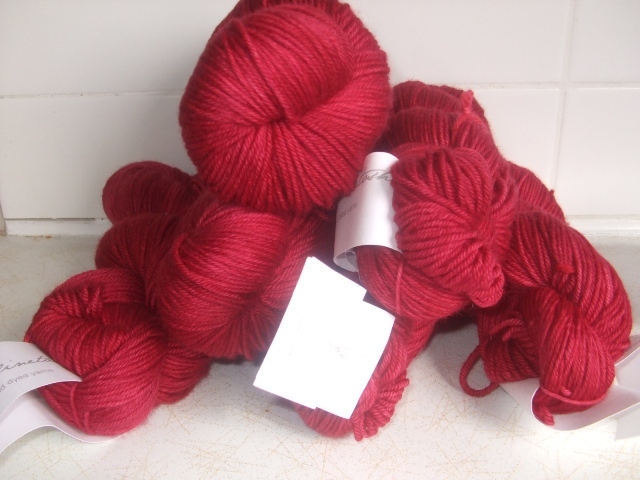 6 skeins of Vermillion Tosh DK earmarked for my next sweater. I am a teensy bit anxious about the fact these look nearly solid – not what I was expecting. I am hoping they knit up a little bit more semi-solid than they appear. Not that it will make a lot of difference to the finished object, but it was what I was expecting from the pictures of FOs on Ravelry. 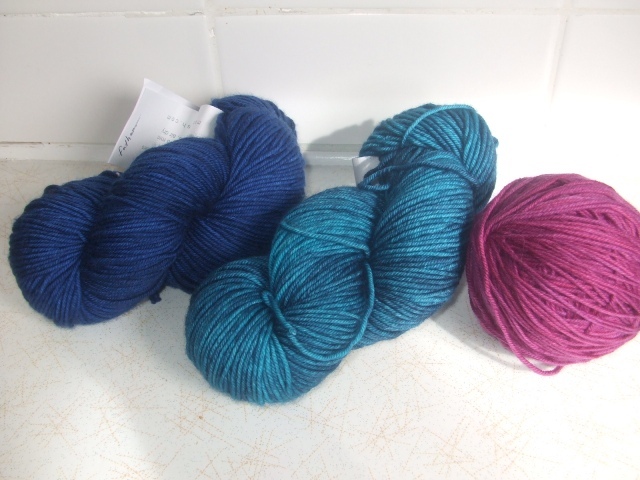 3 skeins of Tosh Vintage, the new worsted weight offering. The Baltic in the middle is for something for me. 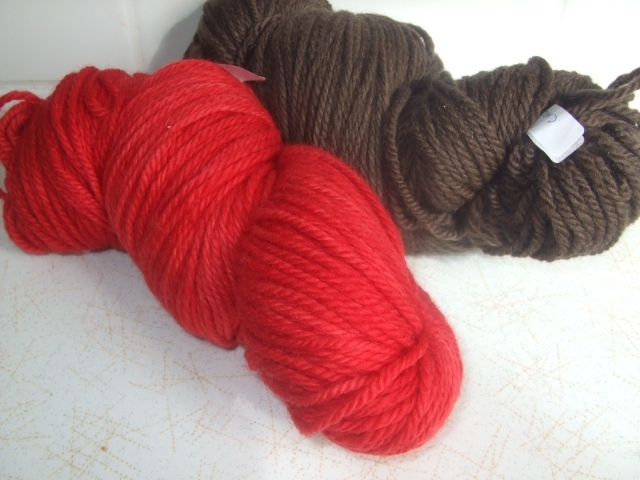 The skein on the left is to stash, and the ball on the right is to knit a gift for a swap I am doing soon. 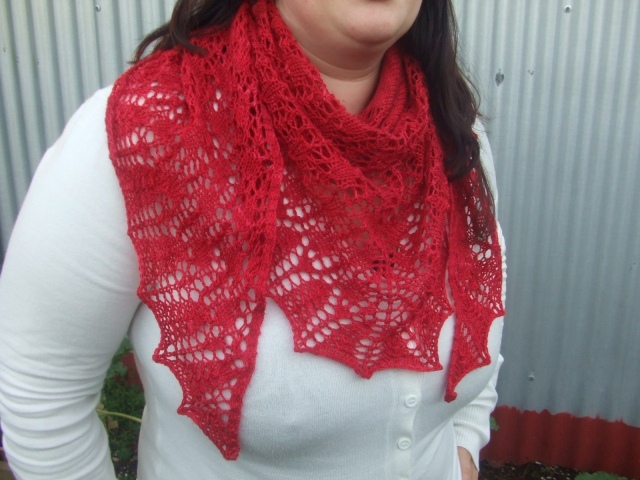 Having had a few questions here and on Ravelry about the unchart that I used for my shawl, I thought I’d give you a sneak peak – here’s a look at a couple of pages of the pattern. You can see each row is clearly marked. The first bit in the blue boxes is the edging. The white boxes are what follows each row up until the repeat starts. 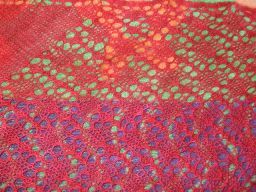 In the pink boxes is the repeat for the first half of the shawl, and the centre white boxes are non-repeated. 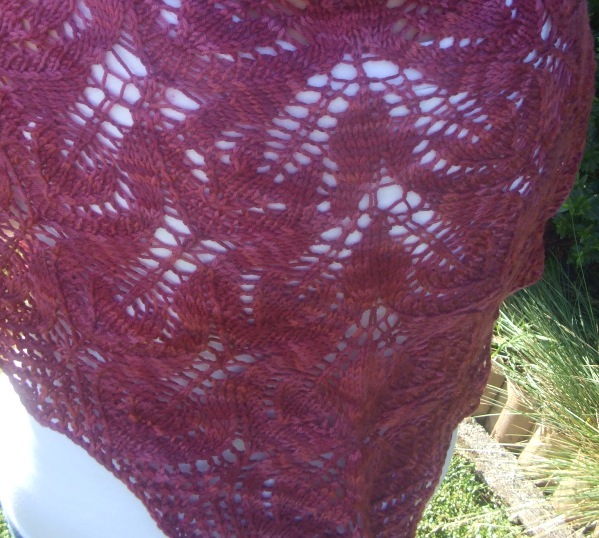 In bold the centre stitches are marked so that you can clearly see this emerge on the shawl. 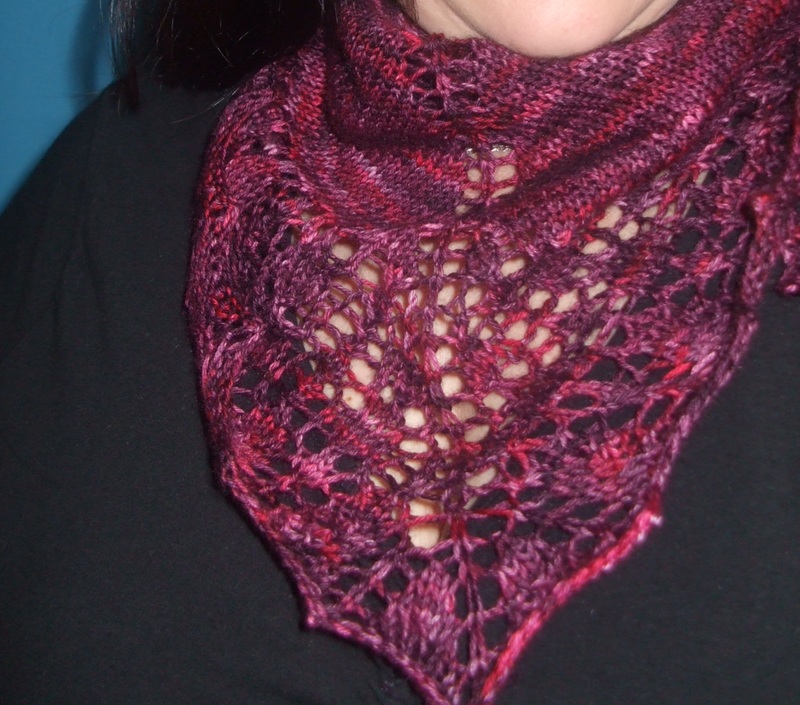 The layout is reversed for the second half of the shawl’s row. In the boxes it has marked what you do – so unlike a chart there is no counting of boxes. If you knit 5 stitches before purling one, one box will say k5, the next on p1. Abbreviations such as kk2 and k2tog are written out, so there is no scrambling for the chart key to work out which one the designer means when you get to a similar looking symbol. This is such a seriously cool idea – it made things much quicker. I am not scared of charts, but I am aware that they do take a little more effort to read than an unchart – this is such a great way to approach a more complex pattern – the whole thing made so much more sense to me this way. If you would like to check out the unchart, the link is here. Now that I am back at work, it seems like I have a different set of clothing requirements – and therefore different knitting requirements. It is supposedly summer here at the moment. Traditionally February is the hottest month where I live, and in my old classroom it gets extremely hot in summer, and very cold in winter. My new classroom is much more temperate thank goodness (although a few students have compared its size to that of a cupboard), and I have had a chance to wear my wee shawlettes already on colder days. But I wanted something a bit more substantial, and fast. Enter some beautiful DK yarn that has been in my stash for over 2 years awaiting the right project. This particular yarn is special to me – it was a gift from a friend who used to live close by and moved out of town. It was a Christmas gift, and as it was for *me* I really wanted to make myself something out of it, but I couldnt’ find the right project. 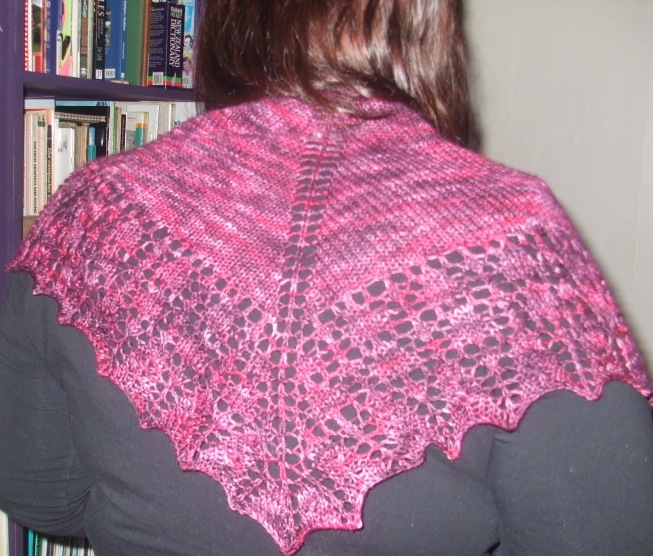 Well, a DK weight verison of Gail seems to be just the thing – I used all but a few grams of the 200g skein. 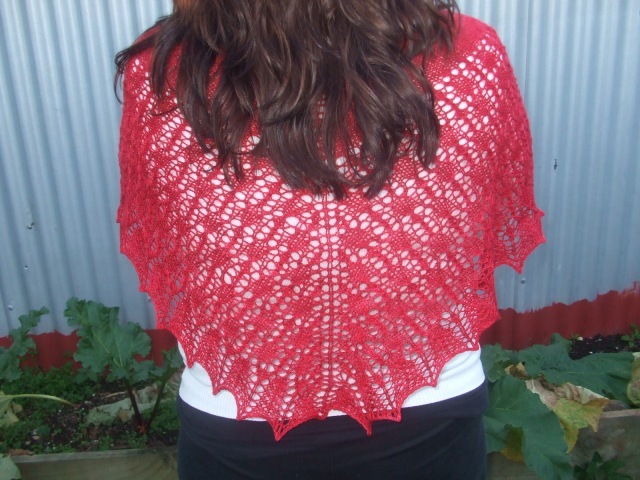 The yarn is a NZ yarn from Touch Yarns, and I used the creatively named colour ‘661’. It is so supremely soft and delicious, this will be gorgeously comfortable to wrap myself in. Now, a quick word about this pattern – Gail is apparently also known as Nightsongs – I’d love to know the story behind the two names… but I digress… The pattern page on Ravelry for Gail is interesting reading – I don’t think I’ve ever seen a designer attack her knitting public on a pattern page before. It seems that knitters are less than impressed with the presentation of the pattern, it appears hard to read or understand perhaps. Either way, it didn’t bother me as I didn’t use the pattern. Not even once. 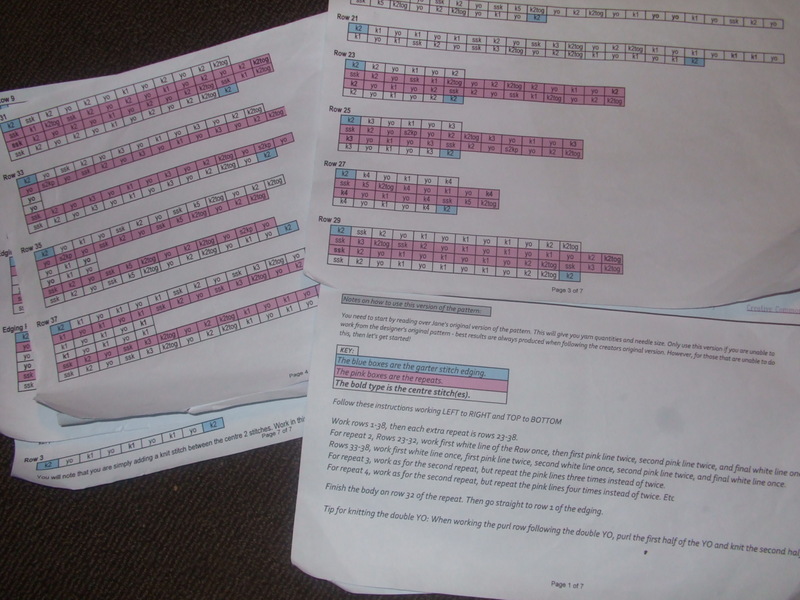 Instead of the charted lace pattern, I used an ‘unchart’, a concept I hadn’t heard of before, but it is a very effective way of communicating a lace pattern and where the repeats are, a mixture of chart – in terms of layout, and written form – in that it does not use symbols but written instructions within a grid. 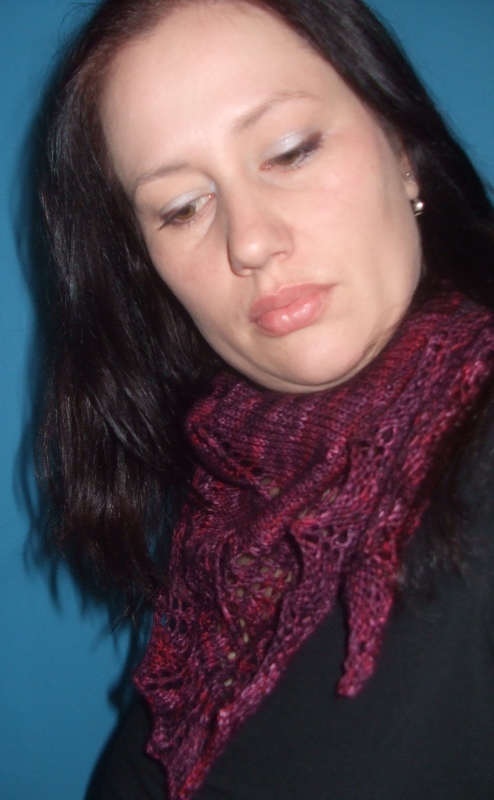 I knit 5 repeats of the pattern. It seemed at times it went very fast, other nights I only managed 4 to 6 rows in an evening. I did a fair bit of ripping back, and actually used lifelifes for the first time ever – after I needed them of course, so I didn’t end up using the ones I inserted. 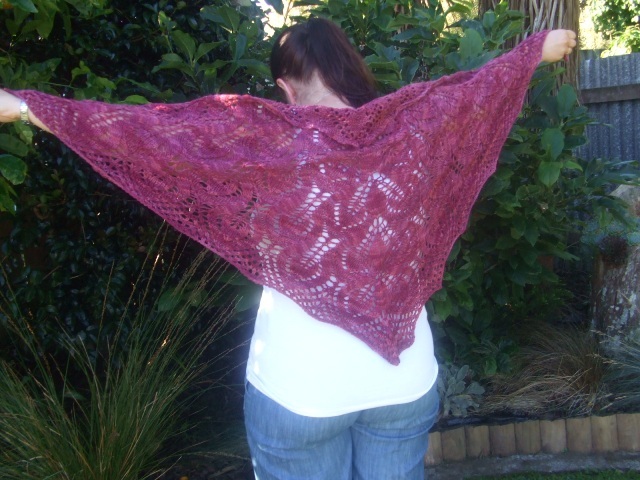 However, the end result is a very pretty shawl that is very wearable and while it isn’t mistake free (darn it finding errors when you are rows and rows past them! ), I am fairly sure there are just the two mistakes, and unless the kids at school are more into detail than they appear, I think I will likely be the only one to notice! 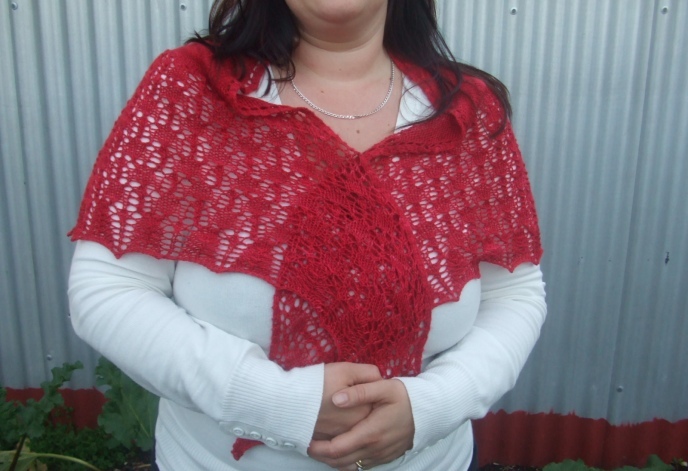 I do think I will block it again before wearing it though – the top is turning over in the pictures, which means it will do it when I wear it too – and while I can’t see it, it will definitely bother me!